I know... I know... These can't even remotely be considered robots, but hey... They are put out by one of the best robotics companies around - WowWee. 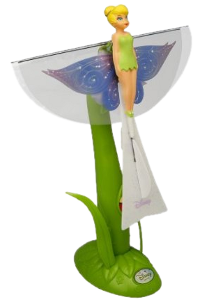 These flyers are part of a larger series that includes the DragonFly (in both green and blue), the BladeStar, TinkerBell, Seasonal Fairies (Sprite, Glitter, Flame and Snowflake), a bat, a dragon, a moth, a mosquito, two butterflies (pink and yellow) and Barry B. Benson from the Bee Movie. The DragonFly is what started it all for me. 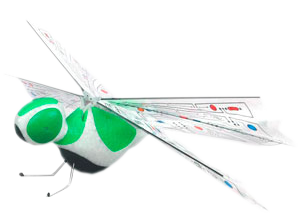 I had never had a flying toy before, but once I took control of the DragonFly, I was hooked! It's movements are so realistic, it's easy to forget that this large "insect" isn't alive. The sound of it's wings beating are really incredible, as well. With it's two-channel digital proportional remote control, you can make this little guy go pretty much anywhere you want. Finally, we have the BladeStar. This is the only one of the three that I own that is specifically designed for indoor use. Sort of a cross between a UFO and a helicopter, this little thing is highly addictive. Twenty minutes after I had the package open (gotta give it time to charge), I couldn't get it back from my girlfriend who had previously outright refused to even try it! This one includes what they call "autopilot" mode, where it uses sensors to detect objects such as flat ceilings and avoids them while you are still in control of it's motion. All of the FlyTech toys utilize a built-in, non-replaceable lithium polymer battery that is recharged through a twenty minute or so connection to it's respective controller. 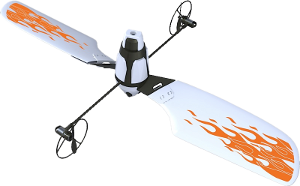 On a full charge, you can get anywhere from five to ten minutes of flying time before you will need to recharge again. That may not sound like much, but it's longer than you think when you are out there flying.